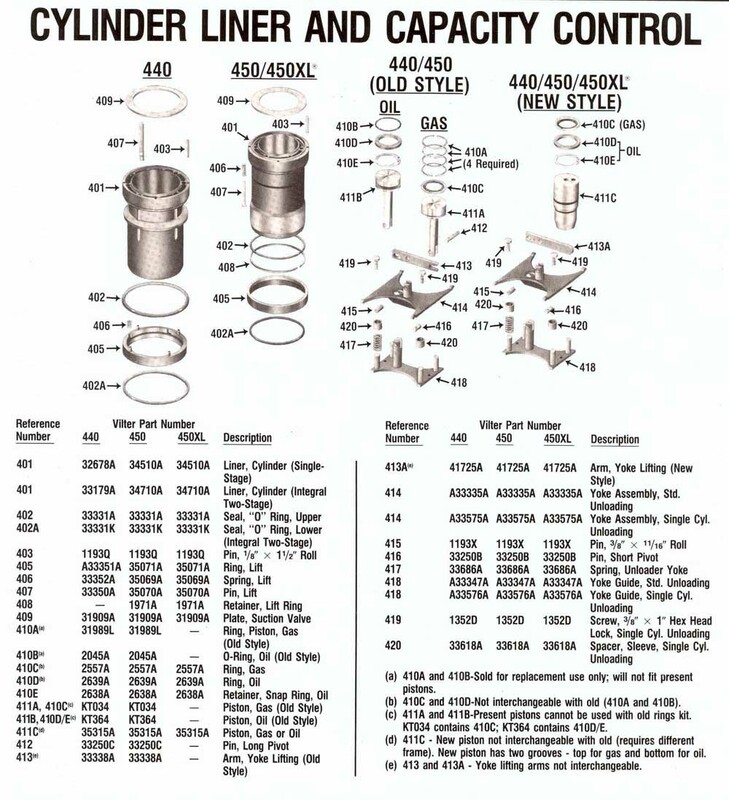 CYLINDER LINER AND CAPACITY CONTROL . .
Ref No 410B-2045A(440 450 "O" RING-OIL(OLD STYLE) . . .
Ref No 410C-2557A(440 450 450XL RING-GAS) . . .
Ref No 410D-2639A(440 450 450XL RING-OIL) . . .
Ref No 410E-2638A(440 450 450XL RETAINER-SNAP RING OIL) . . .
Ref No 413-33338A(440 450 ARM-YORK LIFTING(OLD STYLE) . . .
Ref No 413A-41725A(440 450 450XL ARM-YORK LIFTING(NEW STYLE) . . .
Ref No 415-1193X(440,450,450XL PIN-3/8"X 11/16 ROLL) . . .
Ref No 416-33250B(440,450,450XL PIN-SHORT PIVOT) . . .
Ref No 417-33686A(440,450,450XL SPRING-UNLOADER YORK) . . .
Ref No 418-A33347A(440,450,450XL YORK GUIDE- STD UNLOADING) . . .
Ref No 501-31989M-(440,450,450XL,Pistonring ,compression) . . . .
Ref No 511-35214ST(440,450,BEARING SET-CONNECTING ROD 0.030 UNDERSIZE . . .
Ref No 512-31955A(440,450,450XL,BOLT CONNECTING ROD) . . . .
Ref No 513~518-A32695C(440,SAFTY HEAD ASSEMBLY AMMONIA) . . . .
Ref No 513~518-A32695D(440,SAFTY HEAD ASSEMBLY HALOCARBON) . . . .
Ref No 517-33531B(440,SAFETY HEAD-AMMONA) . . . .
Ref No 517-33531B(440,SAFETY HEAD-HALOCARBON) . . . .
Ref No 517/I522-A350I82A(450,450XL SAFETY HEAD AND PIN ASSEMBLY-AMMONIA). Ref No 517/I522-A35272A(450XL SAFETY HEAD AND PIN ASSEMBLY-HALOCARBON) . 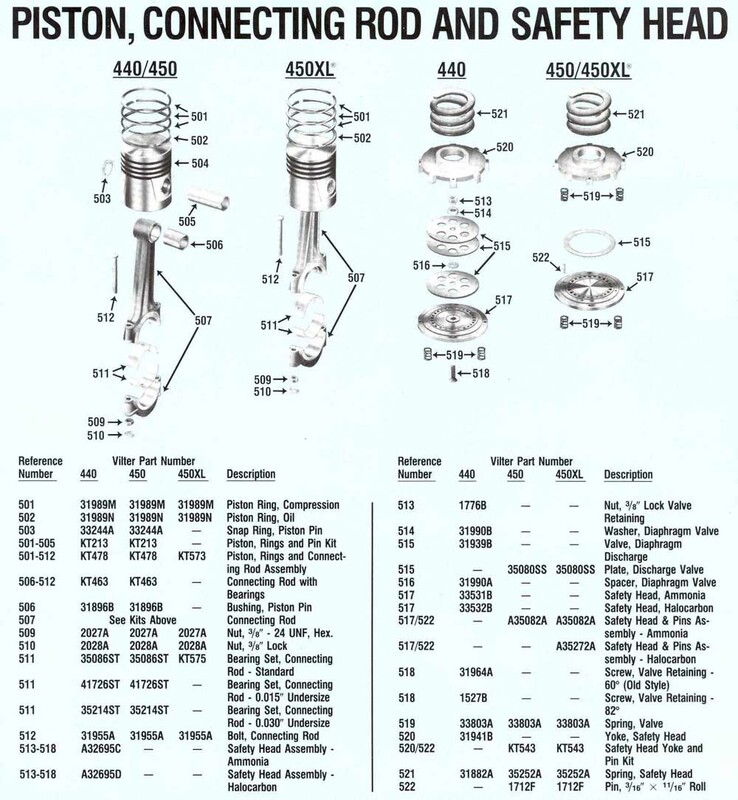 Ref No 518-31964A(440,.SCREW-VALVE RETAINING 60 OLD STYLE) . . . .
Ref No 518-31964A(440,.SCREW-VALVE RETAINING 82) . . . .
>Ref No RECIPCompressorPART402-33331A-440450450XLSEAL-O-RING-UPPER . . . .
Ref No 519-33803A(440450450XLSPRING-VALVE) . . . .
Ref No 510-31941B(440,YORK-SAFETY HEAD) . . . .
Ref No 521-31882A(440,SPRING-SAFETY HEAD) . . . .
Ref No 521-35252A(450,450XL SPRING-SAFETY HEAD) . . . .
Ref No 522-1712F(450,450XL,PIN 3/16 "X 11/16") . . . .
Ref No 201-336518-440450450XL-Cap valve . . .
Ref No 202~208-KT486-440450450XL-Oil relief valve kit . . .
Ref No 209-13264B-440450450XL-PLUG 1/4 'PIPE . Ref No 209~-211-A36240A-440450-COVER FRONT BEARING ASSY FOR 2-1/2'SHAFT(REQUIRES OIL ORIFICE IN ITEM #214 . Ref No 212-31890A-440450450XL-GASKET BEARING COVER . Ref No 213-13159E-440450450XL-SCREW 5/8 x 4'socket hd . Ref No 214-33500A-440450450XL-RETAINER-FRONT BEARING(W/O IL HOLE) FOR 3" SHAFT . Ref No 215-13152E-440450450XL-SCREW 5/8' x 2" HEX HEAD . Ref No 216-13153Q-440450450XL-SCREW 1/2" x 4' HEX HEAD . Ref No 217-A33483A-450-SEAL 2-1/2" SHAFT ASSEMBLY . 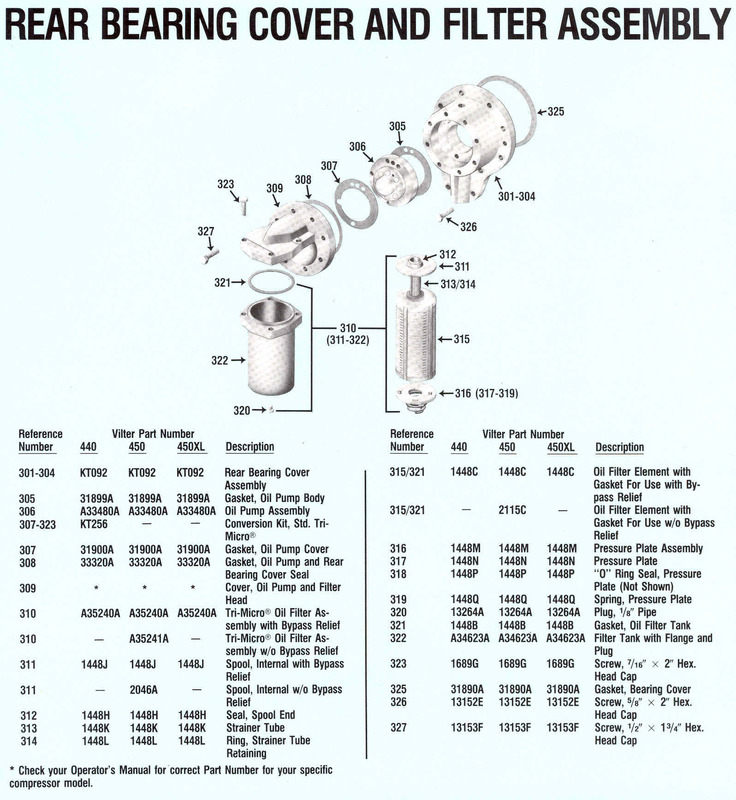 Ref No 217-A33489A-450-SEAL 3" SHAFT ASSEMBLY . . .
Ref No 218-31897A-440450-GASKET 2-1/2" SHAFT COVER . . .
Ref No 218-33496AA-440450450XL-GASKET 3" SHAFT COVER . Ref No 219-13153F-440450450XL-SCREW 1/2 "x 1-3/4 HEX HD . Ref No 220-31044A-440450-COVER 2-1/2" SHAFT SEAL . Ref No 220-32564A-440450450XL-COVER 3" SHAFT SEAL . Ref No 220A-35078A-440450450XL-TUBE OIL DRAIN . Ref No 224-KT366-440450-LOCK NUT 2-1/2 inch SHAFT . Ref No 224-KT366-440450450XL-LOCK NUT 3" SHAFT . Ref No 227-KT368-440450-FRONT BEARING 2-1/2inch SHAFT . Ref No 228-33144A-440450-RING2-1/2" SHAFT FRONT BEARING RETAINER . 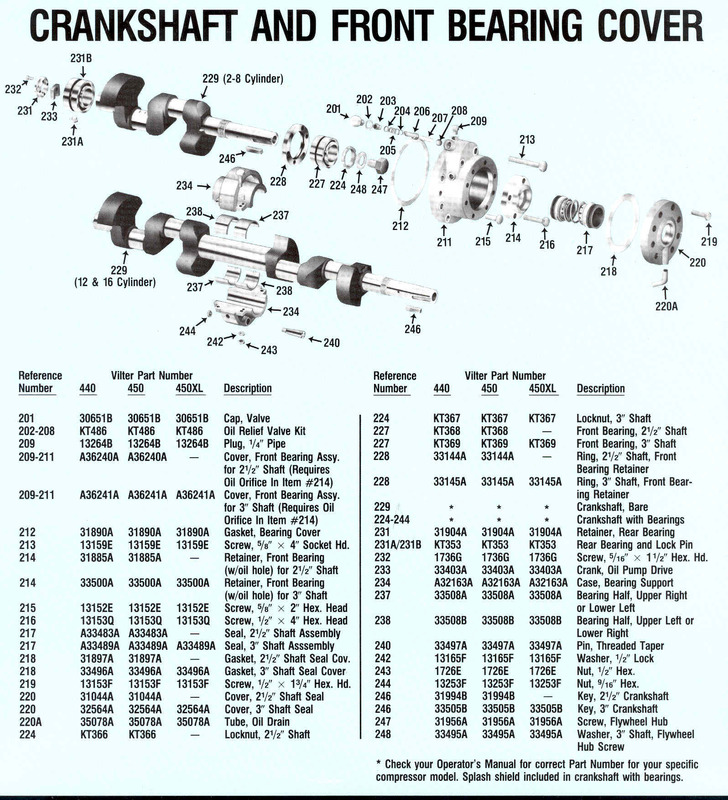 Ref No 228-33145A-440450450XL-RING 3" SHAFT FRONT BEARING RETAINER .. . .
Ref No 229--440450450XL-SHAFT-CHECK YOU COMPRESSOR NUMBER . 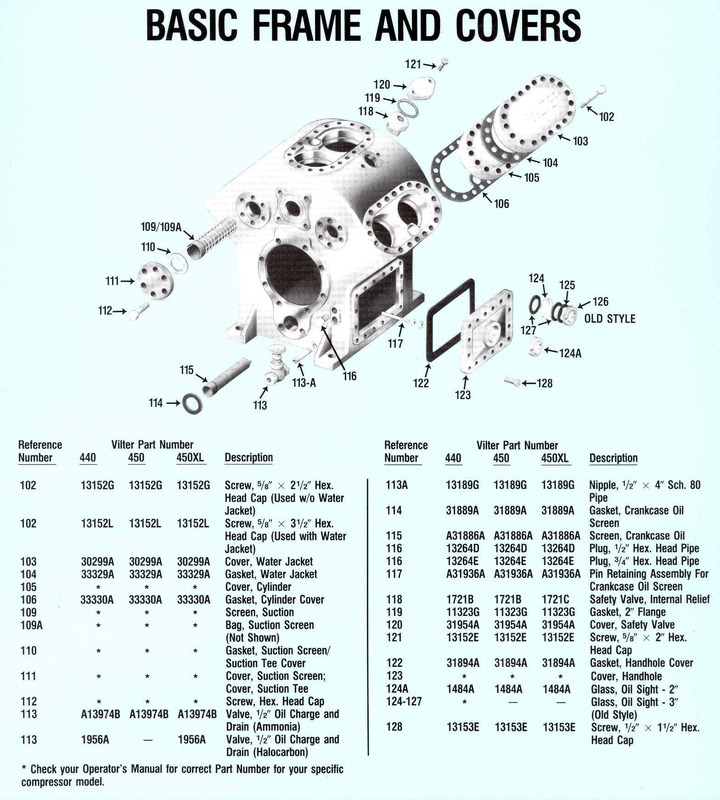 . .
Ref No 224-244--440450450XL-SHAFT WITH BEARINGS-CHECK OPERATING MANUAL FOR YOU COMPRESSOR NUMBER AND BEARING . Ref No 231-31904A-440450450XL-RETAINER REAR BEARING . Ref No 231A/231B-KT352-440450450XL-REAR BEARING AND LOCK PIN. Ref No 232-1736G-440450450XL-SCREW 5/16" x 1-1/2" . Ref No 233-33403A-440450450XL-CRANK OIL PUMP DRIVE . Ref No 234-A32163A-440450450XL-CASE BEARING SUPPORT . Ref No 237-33508A-440450450XL-BEARING HALF-UPPER LEFT-LOWER RIGHT . Ref No 240-33497A-440450450XL-PIN THREADED TAPER . Ref No 242-13165f-440450450XL-WASHER 1/2" LOCK . Ref No 243-1726E-440450450XL-NUT 1/2" HEX .. . .
Ref No 244-13253F-440450450XL-NUT 9/16" HEX . . .
Ref No 246-31994B-440450-KEY 2-1/2" CRANK SHAFT . Ref No 246-33505B-440450450-KEY 3" CRANK SHAFT. Ref No 247-31956A-440450450XL-SCREW FLY WHEEL HUB . BASIC FRAME AND COVERS . .
Ref No 102-13152G-440450450XL SCREW 5/8" x 2-1/2 HEX HEAD CAP-USED W/O WATER JACKET . .
Ref No 102-13152Z-440450450XL SCREW 5/8" x 3-1/2 HEX HEAD CAP-USED WITH WATER JACKET . . .
Ref No 103-30299A-440450450XL-COVER-WATER JACKET . Ref No 104-33299A-440450450XL-GASKET-WATER JACKET . Ref No 105-COVER CYLINDER-CHECK YOUR OPERATOR'S MANUAL FOR CORRECT PART NUMBER FOR YOUR SPECIFIC COMPRESSOR MODEL ..
Ref No 109-SCREEN SUCTION-CHECK YOUR OPERATOR'S MANUAL FOR CORRECT PART NUMBER FOR YOUR SPECIFIC COMPRESSOR MODEL ..
Ref No 110-GASKET SCREEN SUCTION/SUCTION TEE COVER-CHECK YOUR OPERATOR'S MANUAL FOR CORRECT PART NUMBER FOR YOUR SPECIFIC COMPRESSOR MODEL ..
Ref No 111-COVER SCREEN SUCTION/SUCTION TEE -CHECK YOUR OPERATOR'S MANUAL FOR CORRECT PART NUMBER FOR YOUR SPECIFIC COMPRESSOR MODEL ..
. Ref No 112-SCREW HEX HEAD CAP -CHECK YOUR OPERATOR'S MANUAL FOR CORRECT PART NUMBER FOR YOUR SPECIFIC COMPRESSOR MODEL ..
. Ref No 113-A13974B-440450450XL-VALVE 1/2" OIL CHARGER AND DRAIN-AMMONIA ..
Ref No 115-31886A-440450450XL-SCREEN CRANKCASE OIL ..
Ref No 116-13264D-440450450XL-PLUG 1/2" HEX HEAD PIPE ..
Ref No 116-13264E-440450450XL-PLUG 3/4" HEX HEAD PIPE ..
Ref No 117-13936A-440450450XL-PIN RETAINING ASSEMBLY FOR CRANKCASE OIL SCREEN ..
Ref No 118-1721B-440450450XL-SAFTY VALVE-INTERNAL RELIEF ..
Ref No 120-31954A-440450450XL-COVER-SAFTY VALVE ..
. Ref No 121-31152E-440450450XL-SCREW 5/8" x 2" hex head cap ..
. Ref No 122-31894A-440450450XL-GASKET-HAND HOLE COVER ..
Ref No 123-COVER HANDHOLE-CHECK YOUR OPERATOR'S MANUAL FOR CORRECT PART NUMBER FOR YOUR SPECIFIC COMPRESSOR MODEL . . .
Ref No 124A-1484AA-440450450XL-GALSS-OIL SIGHT-2" . . .
Ref No 124~127-440-GALSSOILSIGHT-3"-OILSTYLE-CHECK YOUR OPERATOR'S MANUAL FOR CORRECT PART NUMBER FOR YOUR SPECIFIC COMPRESSOR MODEL ..
REAR BEARING COVER AND FILTER ASSEMBLY . .
Ref No 301~304-KT092-440450450XL-REAR BEARING COVER ASSEMBLY . . .
Ref No 310-35241A-450-TRI-MICRO ASSEMBLY W/0 BYPASS RELIEF ..
Ref No 311-1448J-440450450XL-SPOOL INTERNAL WITH BYPASS RELIEF ..
Ref No 311-2046A-450-SPOOL INTERNAL W/O BYPASS RELIEF ..
Ref No 311-312-1448H-440450450XL-SEAL SPOOL END . . .
Ref No 311-313-1448K-440450450XL-STRAINER TUBE . . .
Ref No 314-1448L-440450450XL-RING STRAINER TUBE ..
Ref No 315/321-1448C-440450450XL-OIL FILTER ELEMENT WITH GASKET FOR USE WITH BY PASS RELIEF. Ref No 315/321-2115C-440450450XL-OIL FILTER ELEMENT W/O GASKET FOR USE WITH BY PASS RELIEF ..
Ref No 320-13264A-440450450XL-PLUG 1/8" PIPE ..
Ref No 321-1448B-440450450XL-GASKET OIL FILTER TANK ..
Ref No 322-A34623A-440450450XL-FILTER TANK WITH FLANGE AND PLUG . . .